As new head coach Bucco Bruce Arians said in January, A-holes usually run in the wide receiver room. It was one of the great early quotes of 2019. At the time, Arians was talking to a Phoenix radio station about Steelers malcontent future Hall of Fame wide receiver Antonio Brown. Today, Brown’s demand for a trade was made public and reports show the Steelers would spare themselves cash and salary cap damage if they get a deal done before March 17. 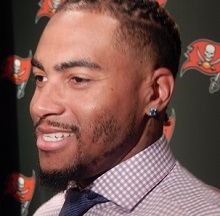 And that brings Joe to the Bucs’ own grumpy but far less productive diva receiver, DeSean Jackson. 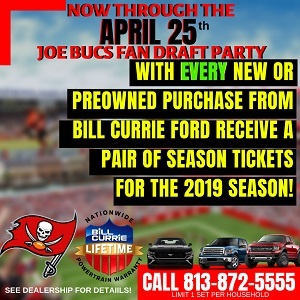 Fans with good sense know Jackson has no business on the 2019 Tampa Bay roster, unless the Bucs want to see him be successful only to bolt in free agency or hold them hostage for a giant new contract in 2020. The best case scenario is for the Bucs to be able to trade Jackson and his $10 million contract for 2019. Even a seventh-round pick would be nice and today Joe is thinking the Steelers might just be a perfect fit for Jackson. With Pittsburgh, Jackson wouldn’t be able to complain about the quarterback. And he’s known in Pennsylvania and maybe the Steelers could restructure his contract. Plus, Jackson always talks about leaving a legacy and wanting a championship. So he should be giddy to play with a contender. Forgive Joe, any angle to get Jackson on a new team gets Joe excited. just swap Jackson for Bryant. Trade problems. And Jackson would probably get to play on a team going to the playoffs. Not the basement of their division. Bryant? Um…..if you’re talking about Martavis Bryant he is no longer with the Steelers as of last year. And he flamed out in Oakland already! Djax can get us a 3rd-4th rounder at least! I believe now with Curry gone (8 million) were are @ 23 Million under the new cap for 2019 (Bucswire had us estinmated at 15 mill) and with Diva Desean gone and hopefully a pick to go with it ….to be @ 33 mill under the cap is looking better. I’d keep Djax personally until the draft and see what we can get. Sign John Brown anyways in free agency. Maybe a draft day trade for Djax just to stick it to him for publicly lobbying to play for another team. That way he misses out on the big free agent contract offers that will happen at the beginning of free agency lol! A “perfect” fit huh @Joe??? When one says perfect, it would have to be “perfect” for the acquiring team as well. A team taking a $21 million dollar cap hit to jettison a diva WR, then would want to take on another $10 million cap figure on top of that, OHHH…AND pick up another DIVA WR!! Yeah…perfect. How long till MeSean disrespects Big Ben for throwing the rock to JuJu too often?!? How long till that all happens? How long till MeSean doesn’t “need to practice” during the week with his new team to learn the offense. Perfect? Sh!t, it’s everything BUT perfect @Joe. Maybe bucco Bruce Will milk us one good year out of that sourpuss. We need one burner for his offence. We need two off linemen and a truckload of def. Personally, I dont see a trade getting done. I think BA persuades DJax to come back, or tells him to hit the road, riding off into the LA Sunset. regardless of if they trade Bryant before or after 3/17 they will still have to eat > $20 mil of his contract. May be some inspiration, but not much. DJax to the Saints. Brees and Payton will know how to use him and he will abuse TB twice a year. are we talking about A.Brown? or A.Bryant? I’m confused….. I would love a 5th round or better pick in trade, but the reality is the league knows the Bucs are going to cut him if there is no trade. Bucs have no leverage. 6th or 7th is all they can get, if they can even get that. i doubt tomlin would want to jump from the frying pan and into the fryer….lol…i think the steelers have learned their lesson and now turn to juju and hope & pray he doesnt become a diva like brown…..
i say call jerry jones….they need weapons….give them djax for taco chalton…..hell, throw in a 6th round pick…. Is Antonio Bryant back in town? Cmon Licht do it. I’d be shocked if he fetched more than a 5th with his age, salary and attitude. I hope Licht can somehow pull off a player for player swap, preferably an Olinemen or corner. Hopefully a starter with less of a salary cap hit. Otherwise release him and free up the 10 mil. Send this POS to the worst possible team you can think of. His punk arse deserves to be forever on a 0-16 team…. what a little beotch he is! Send to Chucky for Karl Joseph and Donald Penn. I know I’m going to catch a lot of heat for what I’m about to say I listen to this. I train Shawn Jackson to the Steelers for Antonio Brown. I release Or trade GMC and Cameron Brate to make up additional cap space for Le’Veon Bell While getting rid of pretty much every running back that’s not named Peyton barber on our roster. I would also go shopping for some free agent defensive backs ie “honey badger”, Collins at safety and pray grimes retires or gets traded. Then there in the draft I would trade out for the best defense of line player possible in the first round to solidify the defensive front. Tampa would become the most feared offense in the League with Jameis Winston a quarterback Le’Veon Bell at running back Mike Evans Antonio Brown Chris Godwin at wide receiver OJ Howard at Tight end. If Jameis can’t find a way to fin with that roster then let my disabled a$$ in and make $20 mil and we will go to the super vowel. Lmao. Jameis can’t get him the ball so what use is he? So Pittsburg would be stoked. Brown isn’t only a one trick pony like Djax. He can turn a short and medium route which is Winston’s specialty to touchdowns. Everyone knows Winston’s long ball leaves a lot to be desired. I think bringing Antonio brown and Le’Veon bell would immediately turn us into contenders. That’s what Arians is looking for…. he doesn’t want to wait to rebuild but he’s not stupid enough to think that we can win with our current roster. That is why they are trimming the fat by letting go high paid, under performing players. Another player that needs to go if not for the ultimate NFL BLOOPER for stiff arms received to the face is Conte….but without a strong run game our passing attack will be weak. That is why we need bell. Also let’s not forget brown is a very good receiving back as well so it makes the offense that much more explosive. Well a bucs fan can dream to have those two on the same team again. Oh and also forgot that we should get rid of will Gholston to save even more money. The talent in this years draft is all defense so if we don’t make some really big splashes in free agency this off season with big name players and bargain shop again then we will fail AGAIN!!! Trade to the Saints??? Why would we trade Jackson to a division foe…thats’ crazy talk. Trade him to the Browns. Trade Djax and 2nd round pick for AB. Pitt can cut him for nothing if they want. Sign bell. I agree that AB is much better than DJAX and more than a one trick pony. But AB earns more than twice as much as DJAX…22 million according to Spotrac with 21 million of that in dead money. I do not know the ramifications of that…but I suspect either the Steelers or his new team pay him his 22 million or the Steelers eat that. LUV will know. But while I concede AB’s talent..all this talk about players like Hunt…Bell…AB….Arians is going to have to add yet another assistant. The team shrink! Get MeJax the eff out of Tampa already! NC bucs. The Steelers will get charged 20 + million on their cap if they release him. That’s why a trade make sense. They get a player for a similar salary, and their cap drops by 10 million this year. @Justafan I think a trade works the same as releasing a player as it relates to the cap. Hey Joe how about this trade scenario, Jackson and McCoy for Brown. Man could you imagine this line up,Mike Evans on one side, Antonio Brown on the other along with OJ Howard AND Chris Godwin?! How would teams defend that line up?! And if you bring in someone like Mark Ingram?! Wow. What a well rounded offense!!! After dealing with Bell and Brown, I can’t imagine the Steelers wanting to deal with another drama queen. Pittsburgh would have to sign D-Jax to a new deal to fit him under their cap, especially with the hit they tale from losing AB. If Pittsburgh needs to free up cap space, why would they take on Jackson’s overpriced contract?? DJax sure was productive when Fitzpatrick was the starting QB. But then again the backup QB (JW) is always a step down in production. Yeah Pitts I sure enjoyed those 3 picks in 5 plays against Pittsburgh. Or how about those fantastic picks vs the Giants. Or how about all 3 of those outstanding points at home against the Redskins? I mean seriously do you even watch our games? BRowns have a stable of backs. Bucs50 you are right. If he isnt on the team for any reason they have to eat the cap. I didn’t realize that. If I was GM, I would accept a slightly worn pair of coaches shorts and a gatorade sideline cooler. Pretty sure the steelers don’t want another head case on their hands. There are other teams that will be interested. Desean Jackson does not deserve to go to a winning team. Trade him for a 7th rounder from next year’s draft if you have to…but trade him to the pwrse team possible. However, I am sure that if he does well, half the people here will blame Licht for letting him get away.